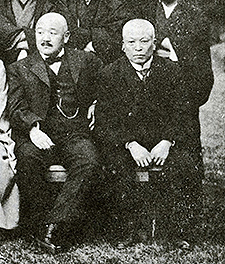 The Institute owns a large number of letters addressed to Seiki Kuroda (1866-1924), a Western-style painter who was deeply involved in establishing the Institute. Regarding them as valuable materials that help us look into a network of personal contacts involving Kuroda, the Department of Art Research, Archives and Information Systems has worked on their republication and research, while seeking cooperation from outside researchers. As part of this initiative, Mr. Takuro Tsunoda, a curator of the Kanagawa Prefectural Museum of Cultural History, was invited to give a presentation titled “Reading letters addressed to Seiki Kuroda from Yoshimatsu Goseda – Profile, Tokyo School of Fine Arts, and History of Western-style Painting in the Meiji Period” at the seminar of the department held on April 21. In recent years, Yoshimatsu Goseda (1855-1915), who is one of the leading Western-style painters in the first half of the Meiji period, has been reevaluated and reviewed through exhibitions and studies by Mr. Tsunoda. Yoshimatsu, who grew up in a family of machie-shi (town painters), went to France earlier than Seiki Kuroda and won a prize at a salon, displaying his talent. After returning to Japan in 1889, however, his activities were rather low-profile. Thus, he was treated as a person whose existence has been forgotten in art circles. Mr. Tsunoda’s presentation this time dealt with the details surrounding the latter half of Yoshimatsu’s life, which had not been told very much, through 25 letters that he addressed to Kuroda since 1908. In many of these letters, Yoshimatsu, who was trying to sell his old works to the Tokyo School of Fine Arts, asked Kuroda, who was a professor of the school, to go between. Kuroda replaced the previous generation, including Yoshimatsu, and led the world of Western-style painting in those days. In fact, a great many Western-style paintings that Yoshimatsu created in the early Meiji period while he was in Europe, such as “Ayatsuri Shibai,” were included in the collection at the school, where Kuroda worked, allowing you to make a survey of the trends in Western-style paintings from the early to the late Meiji period. Mr. Tsunoda’s presentation was an attempt to find positive significance in the creation of the history of Western-style painting in the Meiji period from exchanges between Yoshimatsu and Kuroda, which went beyond their respective positions, and reminded us of the importance of these letters that describe the background.